We were a group of seventy people from fourteen countries – all graduates of the Transformational Presence Leadership and Coaching program (TPLC). 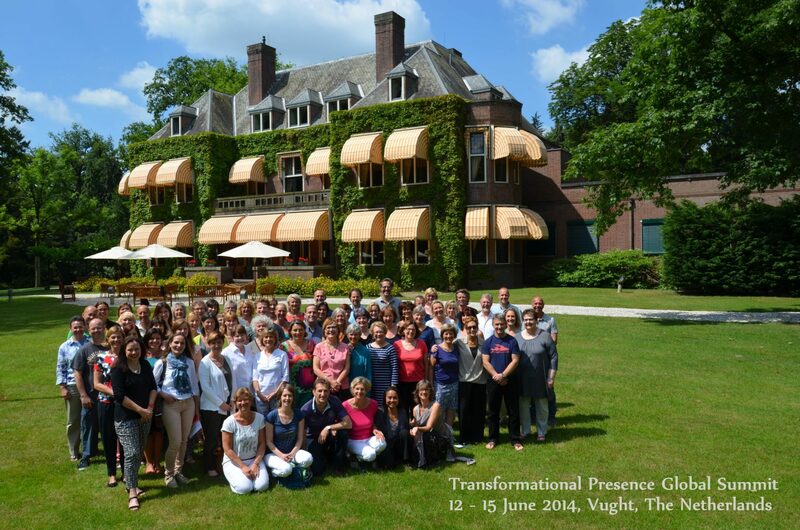 We had come together for the second Transformational Presence Global Summit, gathering at a beautiful old estate that is now a conference center in Vught, The Netherlands. At our first Summit in March 2013, we were a group of thirty-six participants from twelve countries. In just one year, the number of participants had doubled. There were coaches, leaders, entrepreneurs, healers, therapists, artists, visionaries, spiritual teachers, consultants, trainers, managers, and business owners. They ranged in age from mid thirties to seventy. There were bold extroverts and activists, quiet and introspective philosophers, and everything in between. There were Master Certified Coaches and people holding significant leadership positions, and there were people who were starting on a new path. All had something to contribute. Besides having participated in the TPLC Foundation Course, what they had in common was their commitment to making a difference in the world – to do their part to create a world that works. The theme of this year’s Summit was “Recharge, Refresh, and Respond.” We came together to be renewed and inspired, to learn and grow, to be challenged and find support, and to deepen our understanding of what it means to be a Transformational Presence in the world. All of that happened in different ways for different people. In addition to individual learning and growth, new co-creative projects emerged and collaborations were born. More than a third of the participants took active leadership roles in the Summit. There were eleven breakout “Discovery Sessions” led by graduates. The topics included a process for exploring Deep Democracy with groups, a new coaching tool adapted from constellation work, intuitive leadership and coaching skills, dialogue and deep listening for groups, coaching through movement and dance, practical application of the Hermetic Principles, exploring what the natural world can teach us about leadership, and more. Sixteen participants stepped forward with topics for discussion in the Open Space time – topics such as leadership for the world; applying Transformational Presence concepts in education and early childhood development; transformational approaches in working with teams, organizations, and businesses; working with people who have experienced trauma; and ways of empowering those we serve. David Robinson and I shaped the Summit by sharing concepts and tools from his new book, The Seer, and my recent work on transformaction and four archetypes that can help us further embody the energy of Transformational Presence: Seer, Explorer, Co-Creator, and Ambassador. On the evening of Day 2, we were treated to a “gong bath” concert presented by Spirit Connection. As we lay on the floor of our large meeting room, we were surrounded by fourteen very large gongs and many singing bowls and bells. For more than an hour, four musicians took us on an extraordinary sound and spirit journey. It is hard to find the words to describe such an experience. We had spent the day in the energy of the “Explorer” archetype, and this evening certainly deepened our exploration into ourselves and into interconnection of all. The Transformational Presence community is, without doubt, a community rooted in the heart and in a commitment to new ways of being, thinking, and doing. We are all on our own individual journeys of discovery, growth, and development, and we are finding our way as a community. Passions can flare, emotions can be triggered, and contrasts and conflicts in values and priorities can arise. Yet when we can recognize such moments as opportunities for growth, deeper truth, greater authenticity, and perhaps even a breakthrough to a new level of connection as a community, these can be transformational moments. Indeed, this was our experience. We met the challenges, learned, grew, and took steps forward together. The Transformational Presence community and philosophy is a beautiful example of something emerging because it wanted to happen. Several years ago, when reflecting on what I was supposed to do next, intuitively I kept hearing the words, “Say ‘yes’ to the service you are being asked for.” I was being asked for programs on how to show up in the world as an agent of transformation. So I created a five-month teleclass program called “Coaching For Transformational Presence.” The first cohort began in January 2009. Little did I know that, within five years, this program would evolve to become “Transformational Presence Leadership and Coaching” and be offered both as a seven-month teleclass program and as a five-day in-person program. The five-day program has now been presented in six countries: USA, Canada, The Netherlands, Belgium, Sweden, and Romania. Next year we add Poland. In just five years, almost 350 people from 24 countries have participated in the Foundation Course. Creating a global leadership and coaching program was not a vision I was trying to manifest. I just said “yes” to what I was being asked for, and the work took on a life of its own. I continue to listen to the Transformational Presence energy and say “yes,” and the work and community continue to evolve. It’s all an unexpected blessing and gift. At the Center For Transformational Presence, we are blessed to partner with amazing individuals and organizations to continue bringing this work to the world – Jos Rovers and Thom Schouten of Het Eerste Huis and Gabriella van Rooij and Marie Josee Smulders of Stichting Seale in The Netherlands; Anna-Lena Smith and Britt Weide of CoachWalk Academy in Sweden; Katrien Rommens and Nadja Talpaert of Notice the Difference in Belgium; Jan Bowen of Strategic Solutions Services LLC in the Pacific Northwest, USA; Sylvie Gervais-LeDuc of The Art of Excellence in Canada; Dan Manolache of Romania; and Joanna Zawada-Kubik of Coachways in Poland. I have no doubt that others will step forward as time goes on. If Transformational Presence Leadership and Coaching calls out to you, join us for an upcoming program. Dates for 2014 and 2015 are available on our website. And if you feel called to partner with us to bring this work to your part of the world, send us an email and let’s start a conversation. The 2014 Transformational Presence Global Summit is now behind us. It was an extraordinary four days filled with discovery, learning, connection, challenge, laughter, and blessings. Many thanks to all who helped make it possible. The dreaming has begun for the next one. P.S. To learn more about the Transformational Presence Leadership and Coaching program and read reflections and testimonials from graduates, visit our website. And if you would like to have a short conversation to further explore if this program might be for you, just ask.